When the Ordinary just won’t do…. Mary Sweetin is a classically trained violinist, with Bachelors and Masters Degrees in Music from SIUE. Mrs. Sweetin performs with numerous ensembles in the St. Louis area, including the Bach Society Orchestra, St. Louis Ballet Orchestra and the American Chamber Chorale Orchestra, to name a few. She has been the first violinist with the Landolfi String Quartet for over 15 years, and has written over 75 string arrangements for this ensemble. Mrs. Sweetin recently accepted a post as Concertmaster of the University City Orchestra, and is excited to begin her first season with them. As an Adjunct Faculty Member SCC, Sweetin serves as Orchestra Director, Violin Instructor, and teaches several sections of Music Appreciation. Since accepting the position at SCC in 2008, the SCC Symphonic Orchestra has performed a major symphonic work every semester, including such works as Scheherazade, by Rimsky-Korsakov, Symphonie Fantastique, by Hector Berlioz, and Holst’s The Planets. 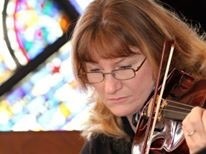 Mrs. Sweetin enjoys private teaching at SCC, and offers lessons to music majors and beginners. alike. Sweetin performs an annual Faculty Violin Recital at SCC, performing many of the standards of the violin repertoire, including Bloch’s Baal Shem, Suite Italienne, by Igor Stravinsky, Violin Sonata in G minor by Claude Debussy, and The Lark Ascending by Ralph Vaughan-Williams, to name a few. In May 2012 Sweetin was named Adjunct Faculty of the Year in the Humanities Division at St. Charles Community College.